The view from our back porch is into lovely woods. 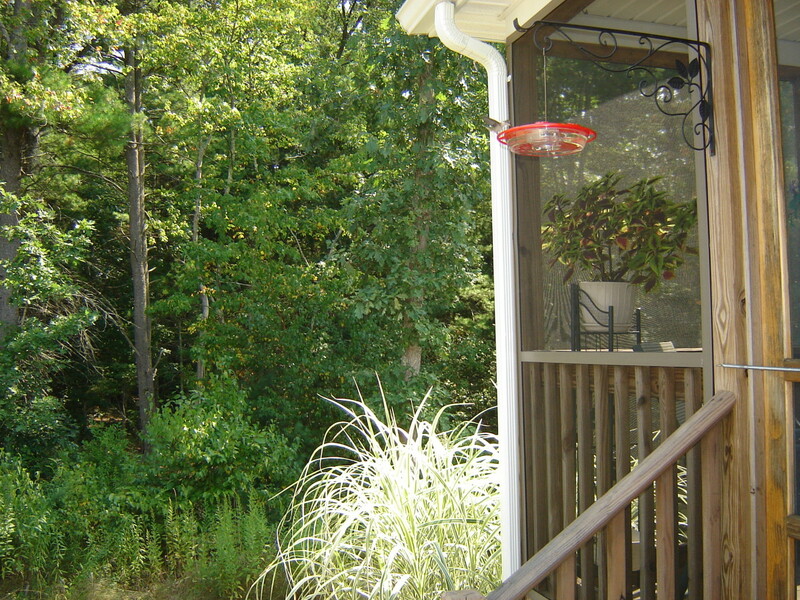 We love sitting out there, listening to the birds, watching turkeys strut out of the brush, and just enjoying nature. The squirrels, the turkeys, the songbirds, and the hummingbirds have a nice view of our home too, but don't have any interest in coming in to join us. The mice, however, that live near the tree line see our home as a convenient source of warmth and food, and would love to live inside with us, especially in cold weather. We would prefer that the mice stayed in the woods. We realize that they were here before we were. Their families may have been right here for hundreds of years, maybe thousands, maybe even millions. In a species-neutral court, I'm sure they could argue that they have more right to live here than we do, so their transgressions into our space are perhaps justified. Or so they would argue if they could. In spite of the obvious injustice, we intend to keep mice out of our home. They get plenty of spilled bird feed as reward for giving up their land, and that's all the consideration they will get from us. Well, that and we do toss out some stale bread now and then. If they can get to that before the birds do, they are welcome to it. We have a contract with a pest control company. We pay them $300 a year and they come around regularly to take care of wasp nests, ants, and anything else that is encroaching on us. I don't like doing that, but I don't want my house overrun with insects either, so I grudgingly accept that. 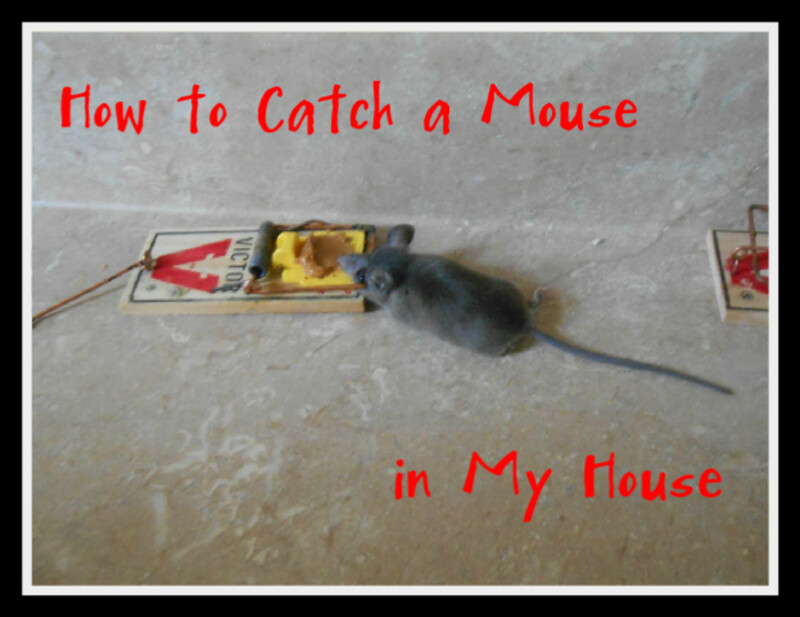 And I really do not like the idea of poisoning mice; but yes, I let the pest control people put down the poison bait. It's the kind that makes mice thirsty and hopefully drives them out of the house to find water and die. What can you do? 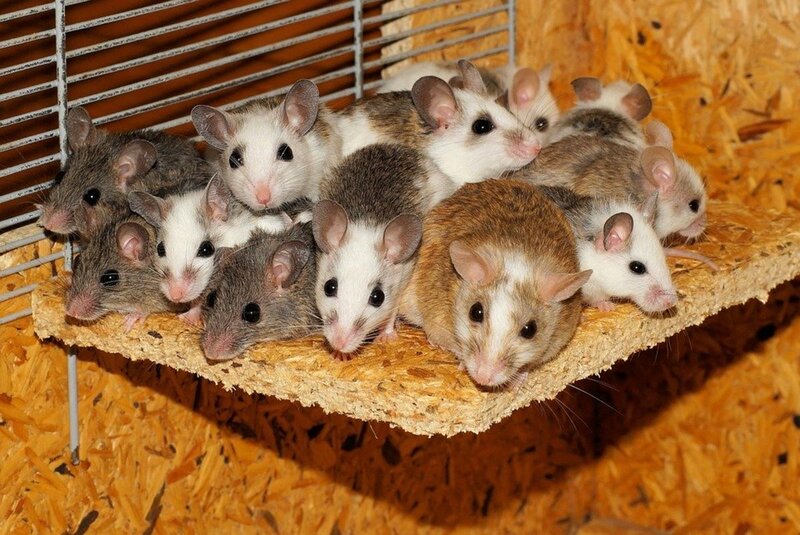 Mice are filthy, they carry disease, and they will literally chew the house apart. They leave their droppings everywhere, it's disgusting and we cannot put up with it. You've seen them. We tried them at our old home; they did nothing. I'd prefer that mice just wouldn't get in the house to start with. If they don't come in, I don't have to find their droppings or throw out cereal boxes they have chewed into. If they don't come in, they don't have to eat the poison that sends them to an unpleasant death. So let's just keep them out to start with. They say that a mouse can squeeze through a hole small enough to push a pencil through. If they can get their head through, they can wriggle the rest in. In a typical house, there are holes far larger than a mouse's head. These are big open doors for mice to walk right through. A lot of these holes are created by lazy contractors. When they install pipes or wires that enter your house, they usually drill a hole far larger than they need, and few will even make a token effort at closing it up. Those holes leak heat, which is bad enough from a cost point of view, but consider what that outflow of warm air means to a mouse scuttling by on a frosty fall morning. Warm air? Wow, that's better than being out here! And look, a big hole I can go through. Let's see what is in here ... is that food I smell? Look for holes. 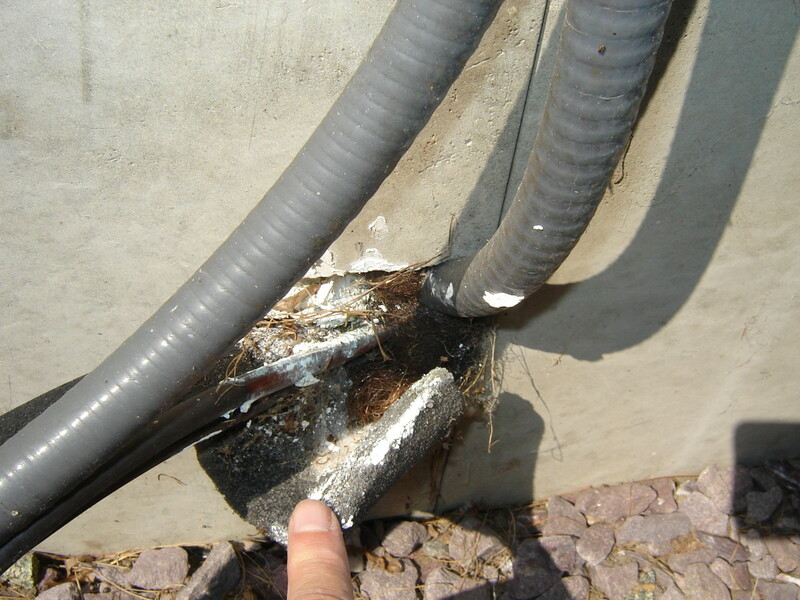 I plug them up with a mixture of caulk and copper wool—it's like steel wool, but made from copper. I use that because it doesn't rust away like steel wool. I have used Brillo pads at times; I figure the combination of soap and steel wool can't be fun to chew through. With any of that, you have to check it regularly. 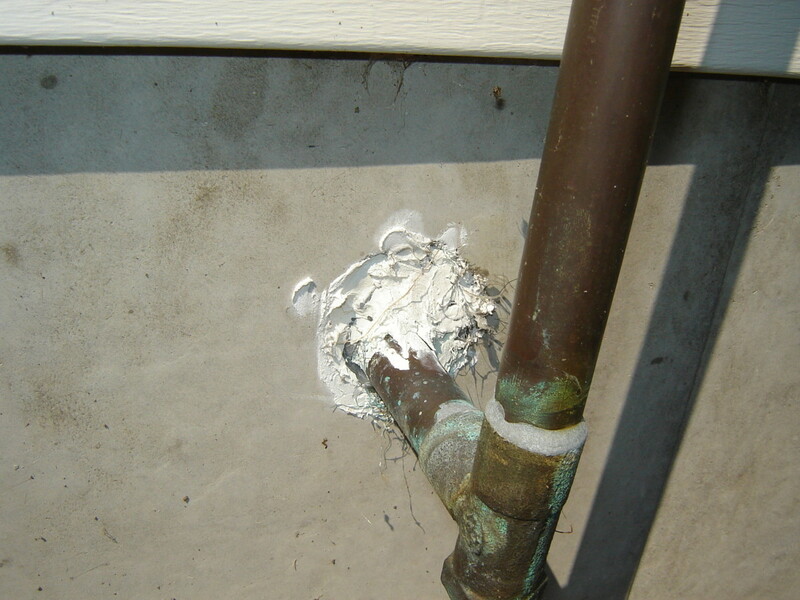 The caulk dries up and will fall out. 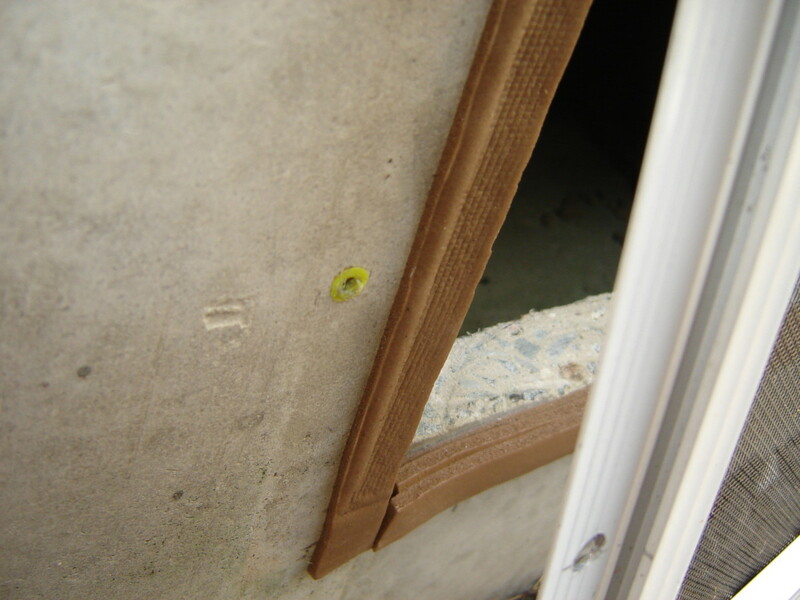 If your siding is loose, mice might be able to climb up underneath. That's not usually easy, but it's worth checking. I found one side of my house was loose enough to get my fingers under it easily - I stuffed some copper wool up there just in case. 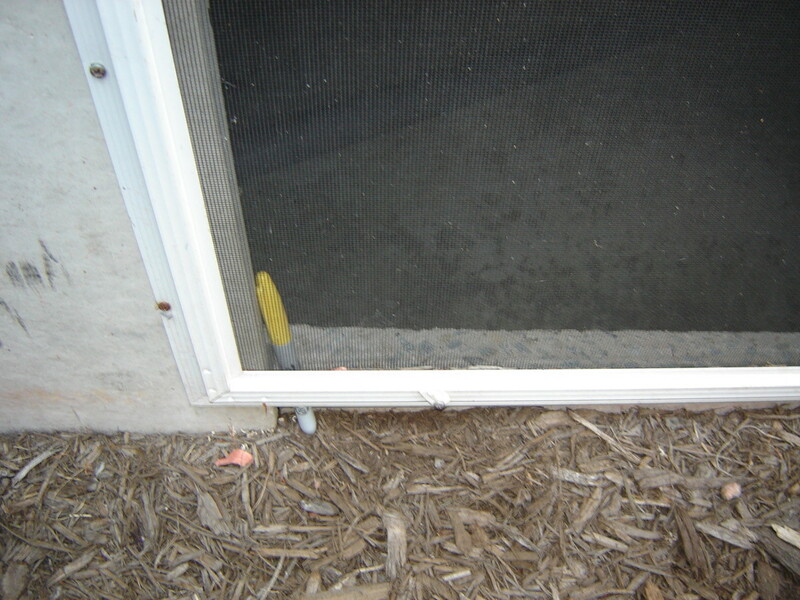 If the siding is loose enough, mice can find their way in through here. There is a very large hole in the floor underneath this where both pipes come up. Having mice in the walls and ceilings is bad enough, but they are going to try to find a way into your living space too. 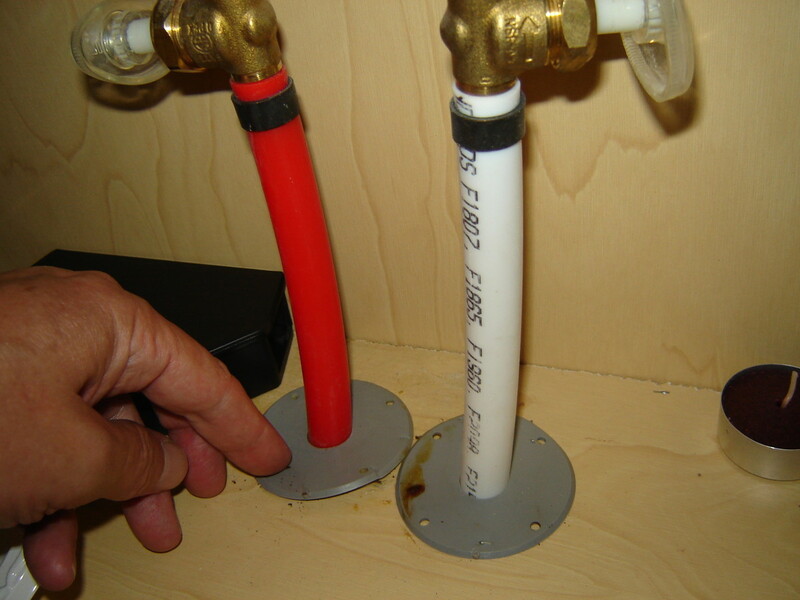 One of the more common entry points is the pipes to your sinks and other appliances. In my home, the hot and cold water come up through a two-inch hole in the floor and then split off to go up to the vanity. A mouse that got into the space under the floor could easily climb up those plastic pipes and now be under the vanity. From there, they might find their way out, or just set up shop there, very warm and cozy. "Great Stuff" is wonderful for plugging up spaces you can't get at. I use "Great Stuff" expanding foam to fill in spaces like that. I can just lift up one the caps in the vanity, stick in the nozzle, and fill it up. Yes, the mice can chew through it, but it isn't an open invitation any more. Telephone and Internet, plus a hole more than large enough for a mouse! We had an electrician run a new plug in our garage and he made big holes in the sill of the house to bring the wiring in. Shortly after that, we had ants. I was sure that was from the work he did; it was too coincidental. Of course we called the pest control people, but I wanted to fix the electrician's sloppiness too because the holes were easily big enough for mice. He did his work from underneath, where it is difficult to get at, so I drilled holes in the garage wall above where he worked and filled it all up with foam. Eventually I will get someone to go into the crawl space and seal it up from that side too, but this will help. There is no point in inviting critters in! 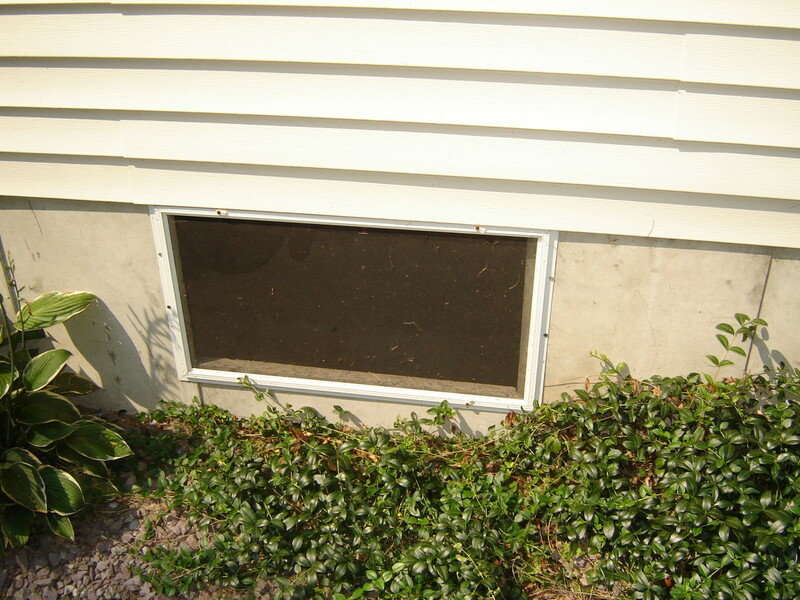 I was surprised to find that my crawl space windows were just such an invitation. The problem is that the bottom of the window isn't flush with the sides: it's at a slight angle. The screen that covers the window has a large gap, which would again leak warmer air to the outside even when covered by the glass windows we put on in cold weather. As you can see in the pictures, the gap is more than large enough for a mouse. I used self-stick insulating foam tape to make a better seal. That's not ideal, because mice can still chew through it. I may have to dig out the earth and straighten these out, but I need to figure out some way to keep them straight. At least the foam keeps warm air from flowing out and attractiing mice, and if they do chew through, I will be able to see that when I pull the windows to inspect the crawl space. Lazy contractors again. 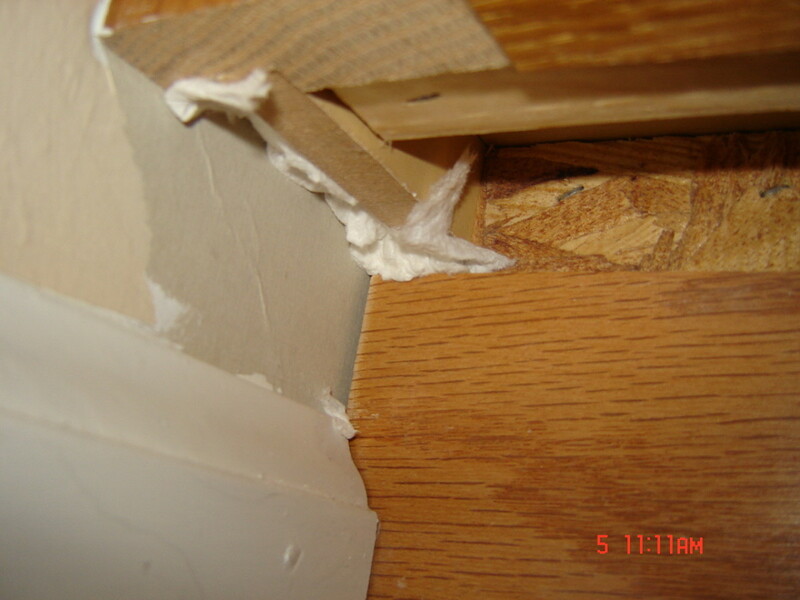 If you pull off your cabinets, you'll probably find holes in the walls behind them. 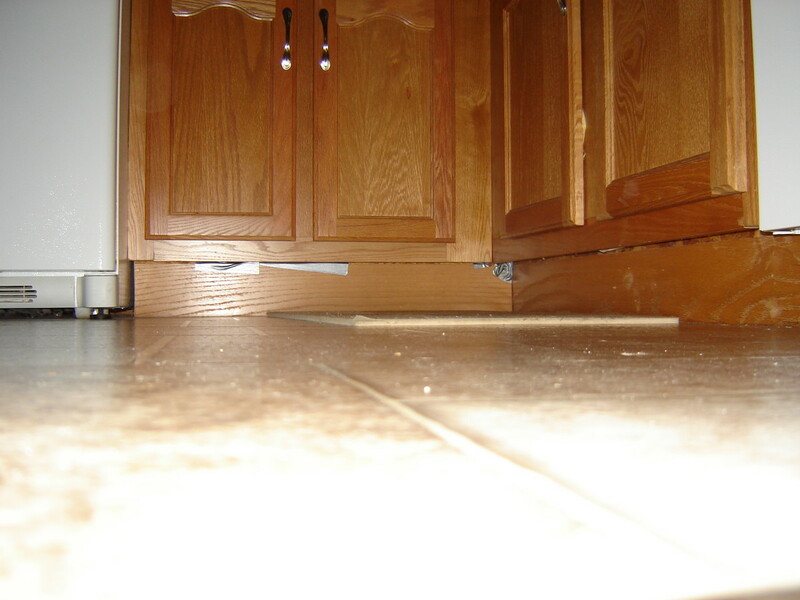 If mice manage to get in from outside, these holes can let them in behind your cabinets. Our cabinets are closed up, but there is space underneath, and that's where lazy contractors left a big exit to the kitchen. You can see where I used duct tape with steel wool behind it to plug these up. You can't see the fix unless you lay on your stomach on the floor, so I wasn't concerned with being neat. Of course, the main thing is to keep mice out of the walls by closing off the outside entrances, but if they do manage to get in, it's better to hear them in the walls than have them get out into your living space! Edge of bathroom cabinets - cold air! I found this recently: I've stuffed it with a paper towel so you can get an idea of the size; it is plenty big enough for a mouse to crawl out of. Could mice get to this place? I don't know, but when I put my finger near it, I could feel cold air, so it is a heat leak at the least. I'd love to tear out these and the kitchen cabinets and really seal everything up, but I'll have to settle for expanding foam. The paper is just temporary until I can get to the foam, but if I find it pushed out in the meantime, I will know for sure that mice can get to there. I wouldn't be surprised, because I'm sure there are big, sloppy holes for the pipes and drains. I'm going to drill some holes in the cabinet floors near those drains and try foaming those up. That's blind work, of course, but better than doing nothing. 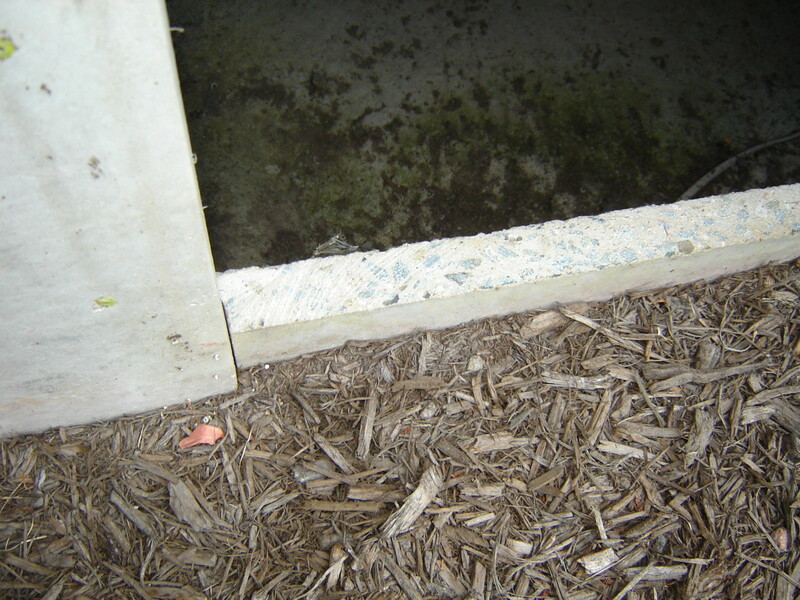 Speaking of that, these homes have a plastic covering underneath that is supposed to keep critters out. "Park Model" camper-trailers may have something similar. We have that covering inspected and patched yearly, but the inspectors might not notice small holes and tears; it's not fun sliding around under there, and they tend not to spend a lot of time. I'm thinking of building a little robot camera I can send under there to look for problems, and inspect repair work people supposedly did and find sneeded repairs they didn't notice in their haste. The screening is thin stuff, and the pest people told me they have seen mice chew through it. They advised getting some heavier stuff to install behind it. I want to do that, but we don't want it to look ugly; these windows are mostly hidden by bushes, but not completely. I have to think about how best to do that. 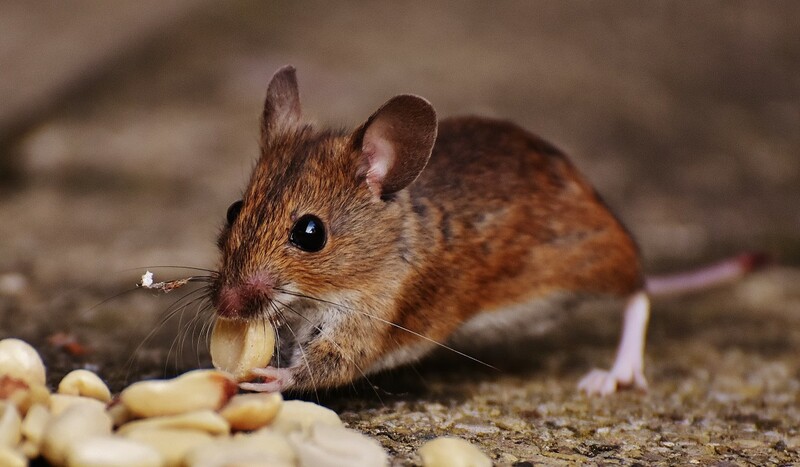 Keeping brush and wood away from your home keeps mice from living near you. The nearer they live, the more likely it is that they will spot an invitation. I said above that we pay a pest control company. Some of my neighbors buy the poisons themselves. I'd rather leave it to the pros. But if you want to do that part yourself, or aren't sure, you might start with Habee's article Mice and Rats: Exterminators or Do It Yourself? It's certainly cheaper, although $300 a year with unlimited service calls isn't much. Ayup - stuff 'em up as best you can - steel or copper wool glued in with wood putty or caulk isn't pretty but it doesn't make for fun chewing..
Wow. I am so glad you posted this. I feel so much better, after reading stories..i don't feel so alone. we have been fighting the mice/rat problem for a couple of months now, and last night was the last straw. my fiancé came home, and screamed when she found a rat in the pantry on the 3rd shelf, dining on the expensive rice flour, and then ran down the apron hanging on the wall, across the floor and lept under the kitchen cabinets. 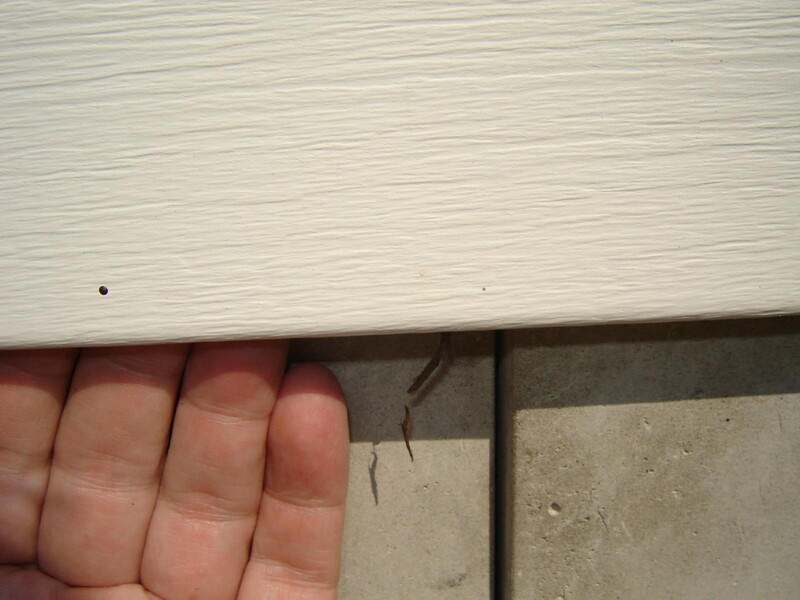 today, we were quite stressed to find holes behind the cabinets, and the exterior siding of our house is very loose. (house built in '78- a "model home"- an oxymoron) i wanted to rip out the old cabinets to "start over" and seal the holes, and rip off the siding outside to "start over" but i am not working right now, so funds are limited. i can only imagine what expensive problems are waiting to be exposed...so, i think i will opt for sealing the exposures as best i can with the aforementioned suggestions. again, the stories here made me laugh out loud. much appreciated. Oh yeah: it takes days to get that stuff off your skin.. I love, love, love Great Stuff except when it gets on my hands of course. 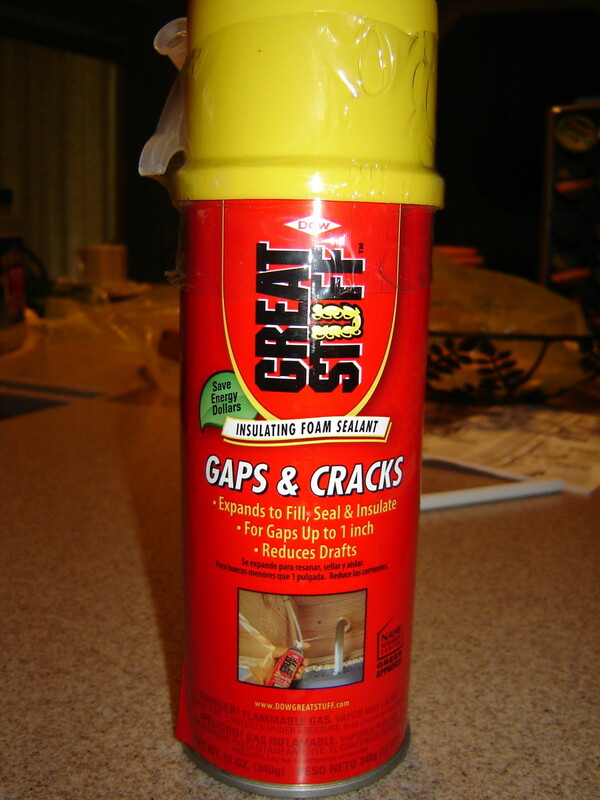 It is really good sealing cracks and filling holes. 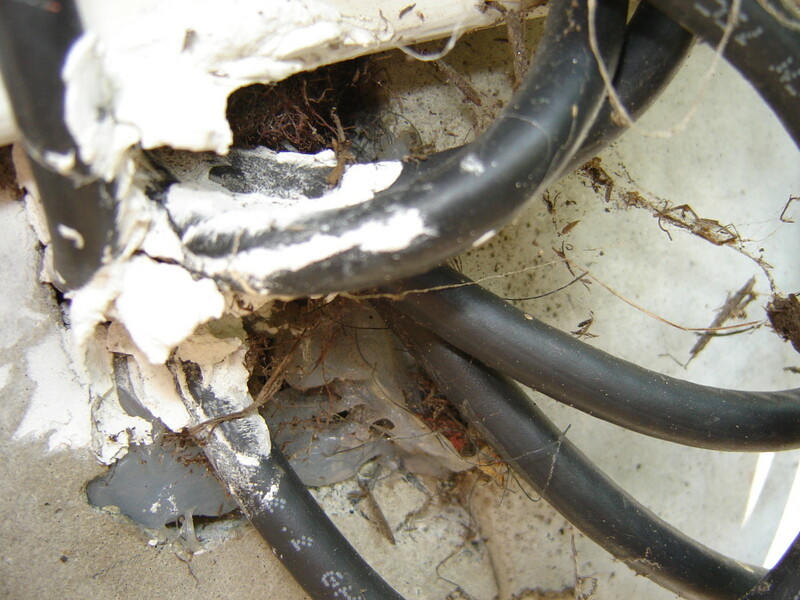 And critters don't seem to able to chew through it which is key when comes to battling mice. Those little buggers can chew through almost anything! We've had no more since my sealing efforts, but I keep checking..
Another excellent hub, Tony, and on this subject we're totally in sync. 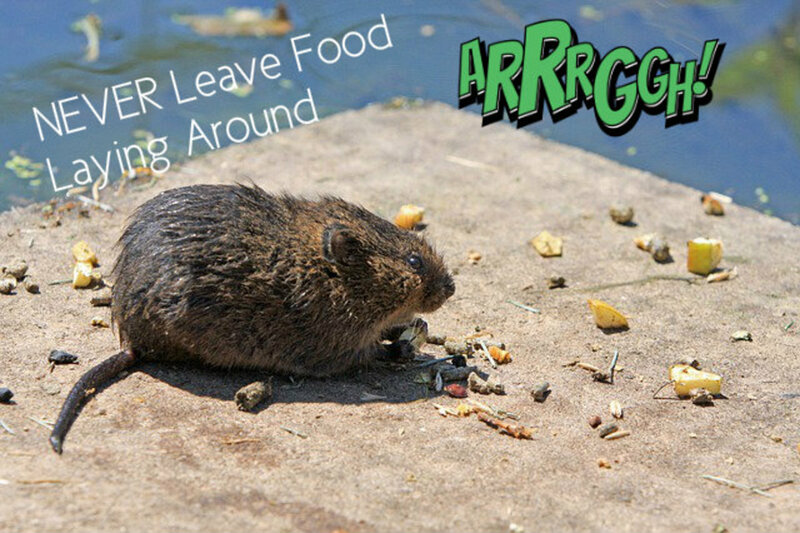 Last April I was being overrun by field mice--they were gnawing holes in packaged food in my pantry downstairs, knocking things over, scurrying through the heat pipes and even gnawing on one of them. The magnification of the sound made the mouse sound like a rat. I also heard them scampering along a heat vent in the attic above my bedroom, making so much noise that they scared my cats. The cats are of the catch-and-release variety, so they were no help in hunting them down. I called a local animal control company, and they were wonderful. The technician they sent out did a very thorough inspection of the house, inside and out, roof to basement, and determined that it's unusually well sealed. The only place mice could get in was along one wall. The technician spent three hours on each side of that wall doing many of the things you described, primarily using copper wool, caulk, and brillo pads. I topped off his efforts with Bait Chunks in the attic and crawl space adjacent to the basement (inaccessible to cats) to kill off the mice already inside the house. On the first night, I heard the mice literally pushing the bait chunks along the vent pipe above my bedroom, gnawing like crazy. On the second night, not so much. Almost no noise the third night, and since then, blissful silence. The technician and the bait chunks did the trick. The cats are disappointed--they loved chasing mice through the house until the mice died of fright and exhaustion--but too bad. I have no tolerance for mice in the house. I realize I'll have to be on the lookout for a recurrence, but so far so good. You have my sympathy--good luck in your extermination efforts! Seriously, yes: the more you can seal, the better off you are. Be creative in searching for entrance opportunities. Arrgh. We found two turds in the bathroom last week! I got down on the floor and found what might be the source (I've updated the hub with a picture). Can't really blame them. It gets cold out. So true. We tried to inspect everyday while construction was ongoing at our house in the country. BTW, Your view is lovely. Absolutely heartbreaking when you see sloppy work that will allow mice to enter. The battle continues all these years later, but I have stopped catching them in humane ways and releasing them. They come right back. It can be SO hard to find them all. 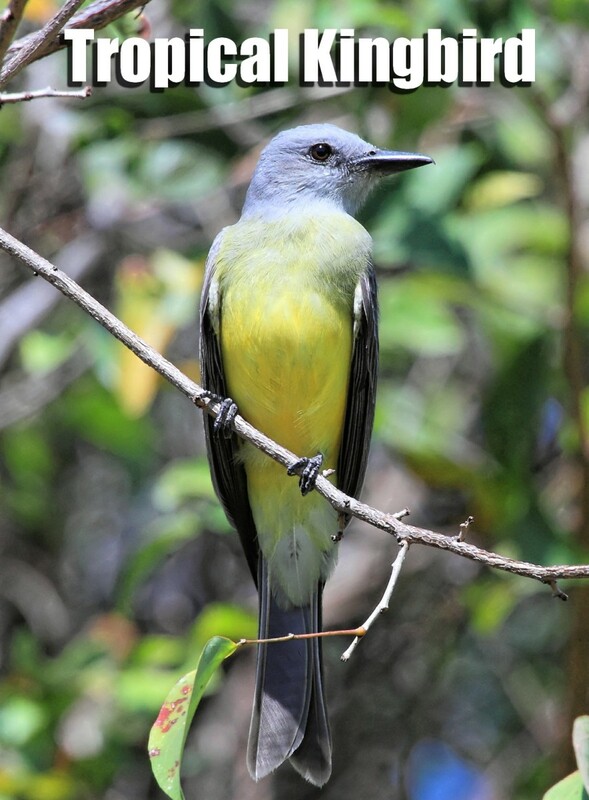 If you can rent or borrow one of those thermal imagers, that can show heat escaping, which means a hole and also an be what attracted the critters to start with. Run around the outside looking for heat and the inside looking for cold. We have a big ol rat. It's like you say, this old house has so many little holes for the rats and mice, its impossible to know where to begin. I don't own the place, just work here, and would like to hire someone to come seal up the holes. I guess I'll have to find a handman. That rat thinks he's my pet - came and sat next to me while I was working on the computer the other day. Ran off under a bookshelf where there was less than an inch of space - and he's a big guy. He dragged the mouse traps off and ate the peanut butter on them - now I can't find any of the traps I set. Perhaps I'll get one of those cage traps and get him out of here. But without plugging the holes I know he and others will be back. Mean old rat will chew up my knitting wool, if I don't do something! But thanks for pointing out the likely entry points. I think what infuriates me the most is that most of this is caused by lazy, sloppy contractors who don't take the time to close up obvious holes. After writing this, I found another big hole at the corner of the house and garage. It was covered by siding, so you couldn't see it, but it was big enough for a rat, never mind a mouse! Just incredibly sloppy and careless! Better to keep them out if you can, but yes, those traps are good. Great tips! Although, if you have small children and pets, poison isn’t really an option. I would choose a mousetrap that’s safe, like the Kill and Seal Mouse Trap by Victor. This trap is 100% hygienic and seals the mouse, so you never have to touch it or even see it. Excellent hub, Pcunix, wish I would have seen this while I was still living at our last apartment. Our mouse problem got so bad, (little tiny field mice,) that at one point I was playing WOW on my PC which was right next to my wire rack where we put our bags of chips, crackers, etc... 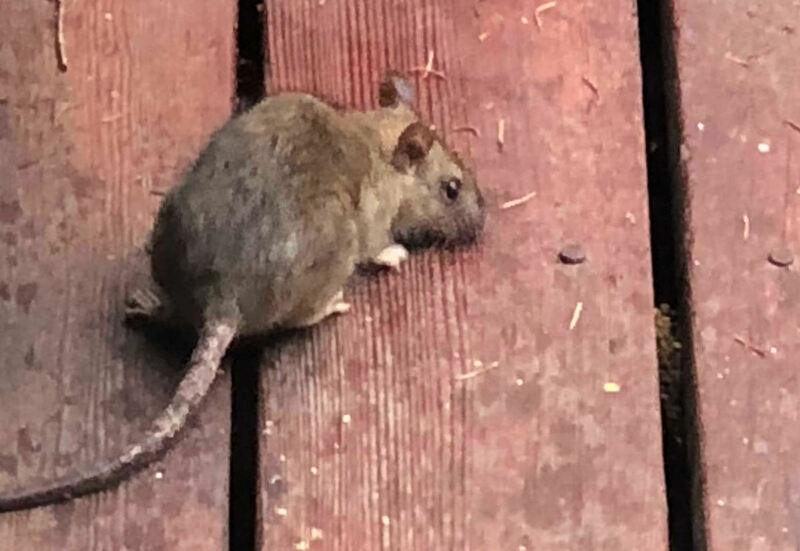 I heard this rustling noise and looked over to see this little field mouse, he had a Ritz Cracker in his hands, (the cracker was bigger than he was!,) and was sitting there entranced by my PC's monitor, eating happily. When he saw me looking at him he continued eating and just stared at me. Like, "Hey, whaddya gonna do about it?" I went out and got a neighbor's indoor/outdoor cat. Kept him for a week and he caught them all, but like you said, during winter months they seek out warm places with nearby food / water sources. Excellent, useful hub, thank-you for publishing this! Good point and yet another reason I dislike poison. We have no cats or dogs, but I do not want to hurt someone else's pet. I detest mice too! My cat caught one last winter and I thought I would die. It is especially annoying when they leave holes in places you cannot get to easily or at all. It would have been easy to fill during construction, but they don't bother. If i could afford to, I would gut the insides and do it right, but that would be ridiculously expensive. Good luck. 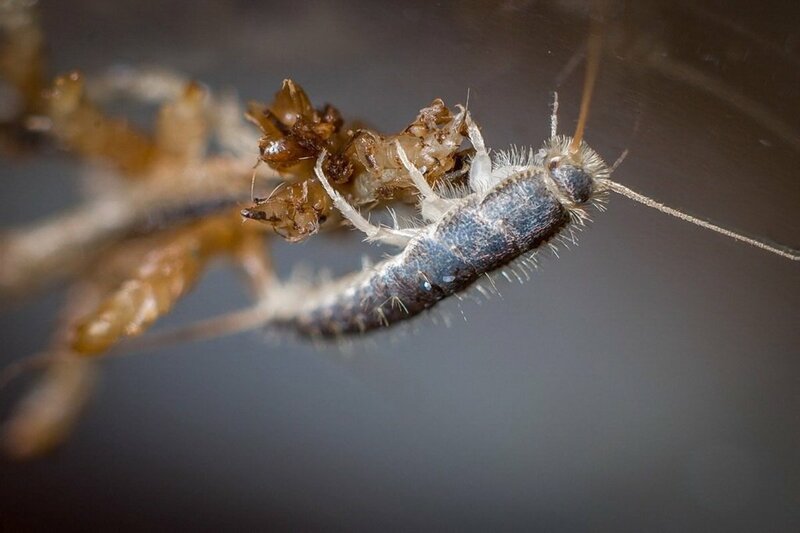 If you are badly infested, you should get an exterminator and then work on sealing up everything. Very useful hub Pcunix.I would do anything to get rid of this nuisance from my home.Thanks for all the tips. As always, well thought out and presented Pcunix.